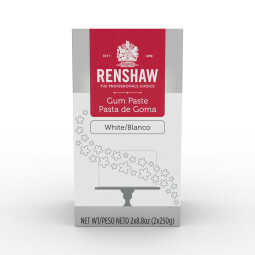 Renshaw white ready to roll fondant icing in the 22lb pail is perfect for creating a stylish rolled fondant cake. Also ideal for decorating cakes, cupcakes and cookies. Sugar, Glucose syrup, Palm oil, Glycerin, Tragacanth gum, Cellulose, Modified starch (Tapioca), Color: Titanium dioxide, Preservative: Potassium sorbate, Flavoring. Serving Per container about 285. Serving Size 1.2oz (35g).